One of the world's most prestigious natural history photography competitions has completed its annual search for entries. Organisers of the the Veolia Environment Wildlife Photographer of the Year have released two images that will feature in this year's competition. 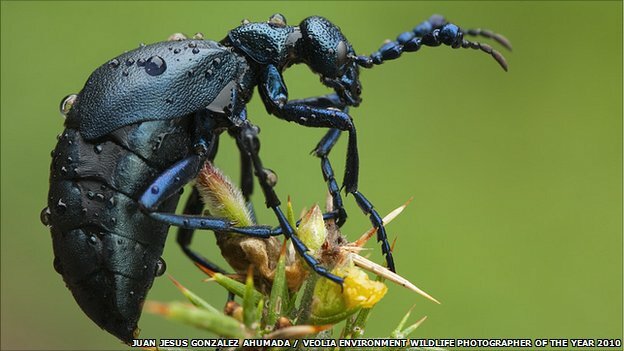 The first - released by the Natural History Museum, London, and BBC Wildlife Magazine to mark the occasion - was an image of a black oil beetle taken by Spanish photographer Juan Jesus Ahumada. Talking about his photo, Mr Ahumada said the creature provided a strange sight, clinging to a sprig of gorse on a cold spring morning in southern Spain. Close up, it reminded him of a beautiful alien, its abdomen almost certainly full of eggs. The black oil beetle is named after the toxic liquid it secretes if grabbed by a predator, which may explain why this female felt unperturbed in the open. The insect is likely to have spent the winter in the burrow of a solitary bee, feeding on its pollen store and eggs. Her own eggs will hatch at the same time as the emergence of those of her host bee. Each larva will climb to the top of a flower and lie in wait to grab a lift on a bee and be carried back to its burrow, where it will pupate and start the species' lifecycle again. The photo was highly commended in the animal portrait category by the competition's judges. The other image released by the organisers was a shot of chinstrap penguins, entitled Back In, Front Out, by Finnish photographer Esa Malkonen. It was judged to have "made perfect sense" of the comings and goings of the chinstraps in black and white. During his time at the penguin rookery in the Antarctic, Mr Malkonen became increasingly fascinated with the activities of the 100,000 or so chinstrap penguins. Having paired up, a male and female devise a rota: one sits on the eggs for up to five days, while the other walks back to the sea to feed. "Even from a distance it was easy to see who was doing what. Black backs told one story, white fronts another," the photographer explained. The image was also highly commended by the judging panel, this time in the Nature in Black and White category. Organisers will be hoping that this year's competition will be less controversial than last year's, which saw the winning image being stripped of its title. Judges ruled that the wolf that featured in the picture, dubbed Storybook Wolf, was probably a "model" and therefore breached the competition's rules. However, Jose Luis Rodriguez - who took the photo - strongly denied that the wolf was a trained animal. The winner of this year's competition, sponsored by French company Veolia Environnement, will be announced on 21 October.